There were 689 press releases posted in the last 24 hours and 154,038 in the last 365 days. NEW YORK, NY , USA, December 3, 2018 /EINPresswire.com/ -- The word “right” is mentioned only once in the United States Constitution and it is in regard to intellectual property rights. That is among the messages conveyed by Undersecretary of Commerce and Director of the United States Patent and Trademark Office, Andrei Iancu, who delivered the keynote address at the second annual IP Awareness Summit in New York last week. IPAS was held by the Center for Intellectual Property Understanding (CIPU), an independent non-profit. Director Iancu said that IP is the engine that makes economic and cultural developments work and that the USPTO is laser focused on achieving these goals. In responding to an audience question about “conspiracy theories” alleging that the patent system is working against inventors and misconceptions created by perpetuation of the term patent “troll,” the Director said that we need to be specific about problems and “not engage in name-calling on either side of the issue.” He said he encourages more public debate and coming up with solutions. Director Iancu, who has degrees in aerospace and mechanical engineering and who has taught at UCLA, said he believed that it is really important for new members of congress coming into office in January, as well as existing ones, be informed about the importance of intellectual property. They should be aware why IP is important to the economy and to America’s standing in the world and competitive position. The World’s Fair held in Chicago in 1893 featured a battle fought by two business leaders for the electric current standard, AC or DC. A similar battle for artificial intelligence or 5G, Director Iancu suggested, would be seen in a very different light today. “We live in a different world,” he concluded. “For the United States to maintain its competitive leadership it is critically important that that we have an IP system and innovation and entrepreneurship ecosystem that encourages innovation; that provides stability and predictability, so folks can invest here in the U.S. confidently. 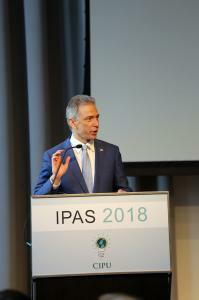 The full audio recording of Director Iancu’s remarks and q&a is available at www.ipawarenesssummit.com. IPAS 2018 was held on November 29 at Pulitzer Hall at the Columbia University School of Journalism in conjunction with Columbia Technology Ventures. In addition to the featured speakers there were four panels 17 other speakers and three breakout sessions for IP owners, creators, educators, investors and others. IPAS 2018 explored defining and providing IP literacy for a digital age. For the program and partners, please visit the IPAS website.